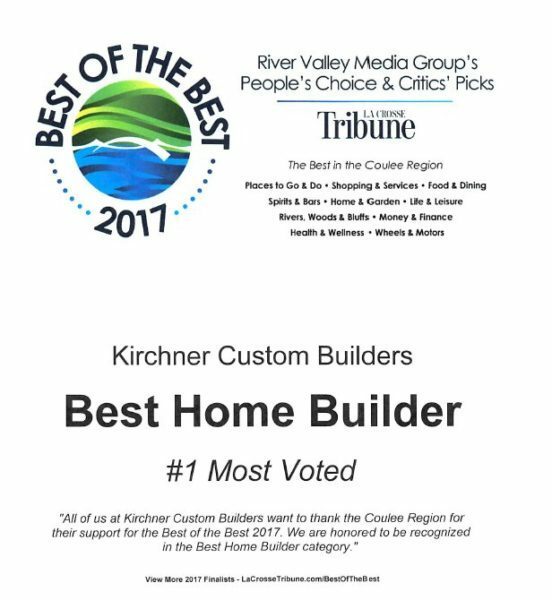 You’ve narrowed down your list of potential contractors to 2 or 3 and have obtained their bids for the construction of your custom-built home. You may think you can simply read through the bids and easily make comparisons between them to determine which contractor to select. 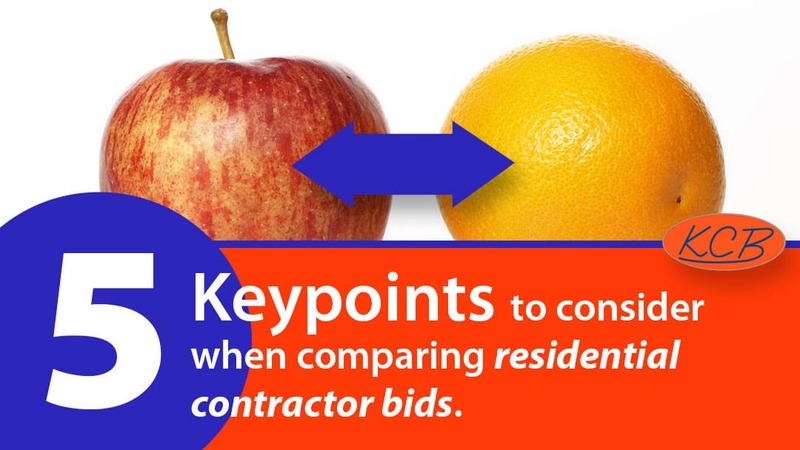 Comparing bids is an “apples to oranges” situation. Each one will be different, sometimes in small ways and sometimes in big ways. It’s up to you to decipher each bid and interpret what is comparable and accurate. Here are 5 key points to consider when comparing your bids. 1. Compare like with like. Overall cost is not a fair way to compare bids. You must break down the bids into comparable pieces or line items. Start by looking at large line items, things like excavation, concrete, the lumber package, windows, cabinets & countertops, and flooring. Residential construction bids should all include these basic line items and it’s a good place to start your comparisons. 2. Determine the level of detail in each bid. The more detail a bid has the more accurate it will be. Beware of ambiguity. If there is vagueness and a lack of specifics, then you are not getting an accurate estimate. Insist on detailed descriptions of the components being used to build your home. A comprehensive bid with line by line details is going to be a more accurate bid than one that is less detailed. 3. Be watchful of allowances. An allowance, by definition, means that specific details and exact costs have not been determined. It’s a “ballpark” estimate. The danger of allowances is that they can be inaccurate and potentially lead to additional costs, and sometimes those additional costs are substantial. A large amount of allowances in a bid is a bad sign because the more allowances listed means the less accurate the estimated costs are. Some contractors intentionally create artificially low allowances in an effort to arrive at a low total bid but they do this knowing you will ultimately spend more on these allowances effectively increasing the actual total cost in the long run. If a contractor doesn’t want to firm up allowances, that is a bad sign. A good contractor will be willing to convert allowances into firm prices if the customer provides the necessary information. Overall, the fewer the allowances the better because fewer allowances equals a more accurate bid. If you’re unsure about something within a bid, seek clarification from the contractor. You can and should go back to the contractor with any questions you have. You can even ask to see the underlying pricing used to create the bid. A good contractor will appreciate the chance to explain his bid. It’s not insulting to ask questions about why something is priced the way it is or how he calculated his bid. If anything, he will appreciate the opportunity to justify his costs. Good contractors want you to have a clear understanding of the bid. Give them a chance to explain what has been laid out in the bid and why. This helps to make the actual construction proceed smoothly with little or no uncertainty about what is included. One contractor may be notably higher in price but give him the opportunity to explain why. He may have a very good reason for it. 5. Ancillary items: who included what? In addition to the structure itself, there are things like the land, window treatments, appliances, furniture, and landscaping that will contribute to the final cost of your home. These are not direct construction costs but they are necessary items for the completion of your home. Different contractors will account differently for ancillary items and it’s up to you to determine who has included what in each bid. It could have a substantial effect on the overall cost. A low bid may be low because the contractor has left out a number of these items, but that doesn’t mean you won’t be paying for them. Wouldn’t you rather know the most accurate and realistic final cost for you home? The inclusion of more ancillary items in a bid equals greater accuracy.